In selected patients with peritoneal carcinomatosis from ovarian cancer prognosis can be improved by cytoreductive surgery and hyperthermic intraperitoneal chemotherapy (HIPEC). Between September 1995 and February 1999, 19 patients (mean age 52 years, range 30–72 years) with peritoneal carcinomatosis from primary or recurrent epithelial ovarian carcinoma were operated with the aim of complete macroscopical cytoreduction. Surgery was followed by intraoperative HIPEC. The data was analyzed retrospectively. Eleven patients had recurrent and 8 primary ovarian cancer. The median progression free interval was 18 months (range 6–36 months). Macroscopically complete cytoreduction was achieved in 9 patients. Cisplatin (n = 16) or mitoxantrone (n = 3) were used for the intraoperative chemotherapy. The median intraabdominal inflow temperature was 41.5°C. Complications occurred in seven patients. Most frequent complications were anastomotic leakage (2/19) and intraabdominal abscess formation (2/19). One patient died postoperatively. The mean (± SD) overall survival time was 33(± 6) months with a 5-year survival rate of 15%. 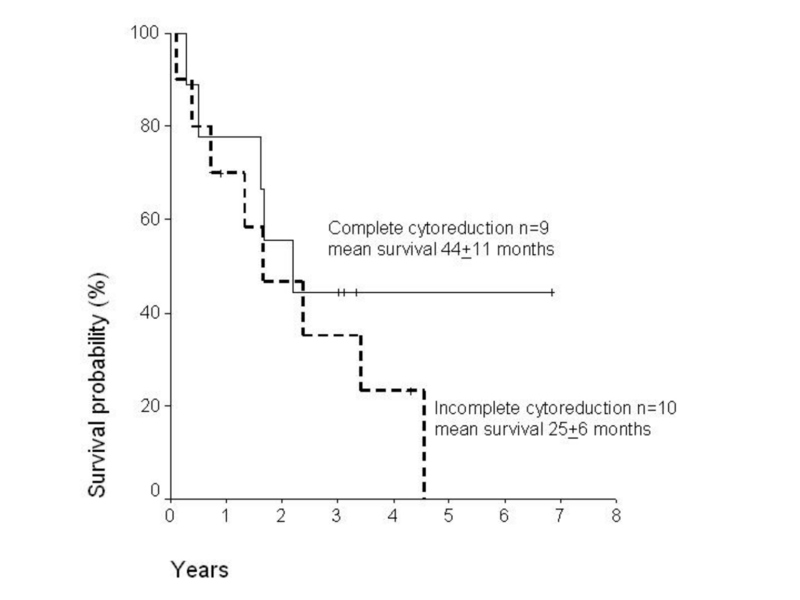 The survival was found to be influenced by the completeness of cytoreduction (44 ± 11 vs. 25 ± 6 months, p = 0.40), tumor volume (54 ± 10 versus 16 ± 4, p = 0.002) and presence of lymph node (38 ± 8 vs. 20 ± 8 months, p= 0.2) or liver metastases (51 ± 9 vs. 21 ± 6 months, p = 0.06). Cytoreductive surgery combined with HIPEC is feasible and is associated with a reasonable morbidity and mortality. Complete cytoreduction may improve survival in select group of patients with low tumor volume and no organ metastases. Among gynecological malignancies epithelial ovarian cancer is the most common cause of death in the Western world and the majority of patients have an advanced FIGO stage III or IV disease at presentation [1, 2]. Current standard treatment of these patients consists of cytoreduction (to less than 1 cm residual nodules) and systemic chemotherapy with paclitaxel along with a platinum agent, either carboplatin or cisplatin . The extent of cytoreduction has a direct impact on survival, and maximal cytoreduction was found to be one of the most powerful determinants of survival among patients with stage III or IV ovarian cancer in a meta-analysis of almost 7000 patients . Over the last decade the treatment strategies have changed and options for prolonged survival are now available. Improved long-term results can be achieved in highly selected patients with cytoreductive surgery (including parietal and visceral peritonectomy procedures) in combination with intraoperative hyperthermic intraperitoneal chemotherapy (HIPEC) [5–7]. However, there are no prospective randomized trials available yet to confirm the superiority of this aggressive treatment concept. Platinum-based chemotherapeutic regimens have been shown to produce high response rates and penetrate the tumor tissue much deeper under hyperthermic conditions when administered intraperitoneally . Due to the peritoneal-plasma barrier, platinum derivatives remain longer in the peritoneal cavity permitting a prolong drug exposure. The complete removal of large tumor masses requires major surgery in number of cases leading to longer operating time and significant blood loss. The main experience with this aggressive treatment has been gained in selected patients with gastrointestinal malignancies [9–11]. Despite extended surgery, most patients return to baseline or better levels of functioning within three months post-treatment and long-term survival with good quality of life is possible . The objective of this study was to analyze the feasibility and results of cytoreductive surgery and hyperthermic intraperitoneal chemotherapy in patients with peritoneal carcinomatosis from ovarian cancer. A total of 19 patients (median age 54 years, range 30–79 years) with recurrent or primary peritoneal carcinomatosis from an ovarian cancer were treated in the Department of Visceral and Transplantation Surgery of the Hannover Medical School between September 1995 and February 1999. The surgery aimed at removal of all macroscopically visible tumor nodules from the visceral and parietal peritoneum. To achieve complete cytoreduction, a variable number of peritonectomy procedures (up to six) were required as previously described by Sugarbaker [13, 14]. These included omentectomy and splenectomy, left subdiaphragmatic peritonectomy, right subdiaphragmatic peritonectomy, pelvic peritonectomy with recto-sigmoidectomy, and cholecystectomy with lesser omentectomy. The complete pelvic peritonectomy represented resection of all affected parietal and visceral peritoneal surfaces. The dissections included stripping of the pelvic peritoneum, a low resection of the rectosigmoid colon and an en bloc removal of all female genitalia. If resectable, partial hepatectomy was performed for metastases. Other extensions included resection of the pancreatic tail, large or small bowel resections. Completeness of cytoreduction was measured by considering the size of the residual peritoneal implants following surgery. Complete macroscopic cytoreduction was defined as no residual tumor or residual tumor of less than 2 mm in maximum diameter. Tumor load measurements were done with the Peritoneal Cancer Index descried by Sugarbaker . This index integrates both peritoneal implant size and distribution of peritoneal surface malignancy. Following surgery, intraoperative intraperitoneal hyperthermic chemotherapy (HIPEC) was performed using a heat exchanger, two roller pumps and a heater/cooler unit (Stoeckert, Munich). This was performed as an open procedure with the Coliseum technique  using cisplatin (75 mg/m2), or mitoxantrone (15 mg/m2), depending on the previous systemic chemotherapy of each individual patient. Intraperitoneal chemotherapy was performed for 90 minutes. For the analysis of postoperative morbidity, all surgical and non-surgical complications that occurred during the hospitalization period were considered. Severe hematological toxicity and nephrotoxicity were classified according to the WHO (World Health Organization) scale. Patients data were compiled into a data base (SPSS®, 11.5, 2003) including epidemiologic, surgical, pathologic and survival figures. Survival rates were calculated using Kaplan Meier method and were compared with the log-rank test (p < 0.05 was considered statistically significant). The median follow-up time was 24 months. Demographic data of the patient population is presented in Table 1. Of all patients, 11 had recurrent and 8 primary ovarian cancer. The median progression free interval was 18 months (range 6 – 36 months). In addition, 13 patients had received prior systemic chemotherapy consisting of regimens with cisplatin/carboplatin alone or in combination with taxanes. At least three of the six available peritonectomy procedures were performed in each patient, including six low anterior rectal resections and nine partial resections of the right or left hemidiaphragm, in order to reduce or completely remove intraperitoneal tumor masses. Bowel resections were performed in eleven patients (seven colectomies and four small bowel resections). Complementary hysterectomy was performed in eight patients. Most of the patients received at least one digestive suture (13/19). In six patients, liver metastases were removed by partial liver resection. The mean operating time was 7 hours (2–16), and patients received a mean of three blood units intraoperatively. In the group of patients studied in this report, a macroscopically complete cytoreduction could be achieved in 9 patients. Details of performed surgical procedures in these patients are described in Table 2. For intraoperative chemotherapy cisplatin was used in 16 patients and mitoxantrone in three patients. Median intraabdominal inflow temperature was 41.5°C. A second intraperitoneal chemotherapy (normothermic) was given to 11 patients in the early postoperative period (within the first five days). The median ICU stay was 5 days (1–47), the median hospital stay 25 days (11–58). Postoperative complications occurred in 7 patients. These included: anastomotic leakage (2/19), abscess (2/19), postoperative bleeding, systemic sepsis, pancreatitis, pneumonia and neurological complication (1 each). Two patients had more than one complication. No WHO grade 3 or 4 bone marrow or renal toxicity (white cells count < 1.9 × 109/l and serum creatinin > 5 × ULN) was observed. A reoperation had to be performed in 3 patients due to anastomotic leakage (2/19 patients) or postoperative bleeding (1/19 patients). One patient died postoperatively due to peritonitis and septicemia following anastomotic leakage. Based on the histological examination and/or preoperative findings (CT scan/operation), lymph node metastases could be found in 14 patients and liver metastases in 9 patients (of which six were removed by liver resection). According to the intraoperative tumor extent, the tumor volume was classified as low (Peritoneal Cancer Index < 15) or high (Peritoneal Cancer Index > 15) in nine and ten patients, respectively. Postoperatively, nine patients received further systemic chemotherapy consisting of carboplatin and paclitaxel. More than two thirds of all patients with epithelial ovarian carcinoma have an advanced stage III or IV at diagnosis. However, in select group of patients, particularly in those with low tumor volume, parietal and visceral peritonectomy with the aim of complete macroscopic cytoreduction and hyperthermic intraperitoneal chemotherapy (HIPEC) may improve the prognosis [6, 7]. Most of our 19 patients had a recurrent ovarian cancer with peritoneal carcinomatosis after a median progression free interval of 18 months. A complete cytoreduction could be performed successfully in half of our patients, which is similar to other data (30 – 50%) in unselected patients . Despite a general acceptance of cytoreduction during primary treatment, the role of secondary cytoreductive surgery for recurrence is still to be defined , although first data suggest that survival may be improved in certain patients . Following resection, intraperitoneal hyperthermic chemotherapy was performed in our patients. The main cytostatic agent we used was cisplatin. A randomized study could showed that priority should be given of this administration route compared to the intravenous route in patients with stage III ovarian cancer, if the residual tumor is 2 cm or less . Not only survival was better, intraperitoneal application of cisplatin also had significantly fewer toxic effects. However, the patients treated had not received prior chemotherapy, and consequently in these patients tumors may have been highly sensitive to cisplatin. Due to high cumulative doses and/or impaired renal function, mitoxantrone was used as second-line therapy intraperitoneally in some of our patients. Regimens were given according to previous published reports . In our opinion, if complete macroscopic cytoreduction is possible, normothermic chemotherapy should follow the HIPEC procedure in the early postoperative period. In patients with gross residual disease, systemic chemotherapy may be given. The overall morbidity was similar to that found in established centers where cytoreductive surgery for peritoneal surface malignancies is performed [21–23]. The relatively high major morbidity rate in this study compared to other reports in the literature on surgery for recurrent ovarian cancer is due to more extended resections in our series, particularly in the upper abdomen, in combination with HIPEC. The most frequent surgical complications were anastomotic leakage and intraabdominal abscess. These are probably caused by the surgical trauma of the intestinal wall with seromuscular tears. Most of the patients had prior surgery and intraabdominal adhesions. Intraoperative chemohyperthermia does not seem to increase this risk, although some spontaneous small bowel fistulas were reported after closed intraperitoneal heated chemotherapy . Morbidity related to chemotherapy is determined by the type of substance used and particularly by the dosage and regimen of administration. We started by using cisplatin in rather high doses (150 mg/m2) and had more renal and bone marrow toxicity, although serious complications such as grade 3 or 4 toxicity did not occur in our patients. Over the last years we reduced the doses to 75 mg/m2, in concordance with published pharmacological data after intraperitoneal administration . As in similar studies  the one patient who died underwent extensive surgery for massive diffuse peritoneal carcinomatosis. The cause of death was septicemia due to anastomotic leakage and peritonitis. As for other major interventions, morbidity and mortality are increased during the learning curve and decrease with cumulative experience [22, 23]. The role of secondary cytoreduction for recurrent ovarian cancer is still a matter of controversy as the impact on survival is questionable . The overall survival after cytoreductive surgery and HIPEC in our study group was poor. However, improved survival following complete cytoreduction could be demonstrated. Although there was no significant advantage, a trend towards improved survival after complete cytoreduction was observed. The median interval from initial diagnosis was 18 months. As in previous reports, patients with a recurrence-free interval of 13–24 months have a better survival . Due to the length of the platinum-free interval, patients with more than 12 months have a good response to second line treatment compared to the use in primary therapy. The subset of patients who are good candidates for repeat cytoreduction are those with an initial disease-free interval of more than 12 months and resectable isolated nodules, no more than three . The tumor volume had a direct impact on prognosis in this report. Survival difference between low and high volume patients was statistically significant. The role of Peritoneal Cancer Index, expressing the tumor volume, was also found to be a prognostic indicator for the survival, similar to other study . Results can be improved by excluding patients with large tumor volume, in which complete cytoreduction seems unlikely . Our data indicate that cytoreductive surgery and hyperthermic intraperitoneal chemotherapy is feasible and associated with a reasonable morbidity rate and mortality rate in patients with peritoneal carcinomatosis and ovarian cancer. Complete cytoreduction may improve survival in highly selected patients (low tumor volume and no organ metastases). However, most of the published series are rather small and prospective randomized controlled studies are necessary to investigate the role of this aggressive treatment concept. PP carried out the treatment and drafted the manuscript. MHD carried out the chemotherapy and performed the statistical analysis. ML participated in the design of the study. HJS participated in the design and coordination of the study.